NASA's not saying there's life on Mars just yet, though. Last week there was a bit of a hullabaloo about some comments NASA's John Grotzninger - the lead researcher on the Curiosity rover mission to Mars - about some discovery that was "for the history books." NASA issued a statement making sure we knew it wasn't that big of a deal. Today, at the American Geophysical Union's meeting in San Francisco, NASA scientists did reveal some promising results from Curiosity's on board instruments, including the presence of some compounds that contain the element carbon. NASA has more testing to do to make sure the carbon did not make the trip on the rover from Earth, but it looks like conditions for microbial life might have been possible on Mars. "We really consider this a terrific milestone," said Paul Mahaffy, NASA's lead scientist on data gathered by the Sample Analysis at Mars, or SAM unit, on Curiosity. "We have no definitive detection of Martian organics at this point, but we will keep looking in the diverse environments of Gale Crater." 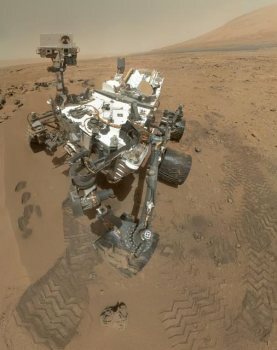 What Curiosity found on Mars was a surprising amount of water locked into the grains of sand and dust found in the soil. There aren't lakes or anything, but scientists were surprised to find this much moisture. On top of that, the Curiosity rover discovered a compound called perchlorate - a toxic substance that includes oxygen and chlorine. When analyzed by the SAM instrument and heated, the perchlorate excreted a chlorinated methane gas containing traces of carbon. NASA scientists consider methane an organic substance, but they want to be very sure the sample wasn't contaminated somehow. "We have to be very careful to make sure both the carbon and the chlorine are coming from Mars," Mahaffy said. Still, the theories have started flying. Perchlorates are used as a rocket fuel here on Earth, and it's possible Martian microbes evolved a way to use the compound as a source of energy. Of course, after NASA confirms these compounds came from Mars, they then have to rule out it was created on Mars and didn't crash land on the red planet from some other cosmic body. "We just simply don't know if they're indigenous to Mars or not," Grotzninger said. "You have ... to decide whether or not those formation pathways are abiotic, or maybe in the end biologic. There's a complicated decision pathway there, and we have to explore each one systematically." Like the Curiosity's namesake, the rover's groundbreaking discoveries just lead to the desire to ask more questions. One day, we'll find the little green men on Mars, but sadly today is not that day.